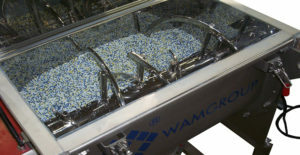 Mixing Blades – WAM Inc. There are subtle variations within the category of mixing blades; examples include propellers, impellers, turbines, gates, anchors, sharp blades and paddles. More specific types of mixing blades include axial flow pitched blade, axial flow fan turbine, axial flow propeller, screw centrifugal impellers, open radial vane, radial flow turbine, radial flow paddle impellers, helical, hydrofoil, mixed flow, and rotating coil. Mixing blades can be made out of plastic, aluminum, bronze, brass, composite, rubber, titanium, or stainless steel. Important factors to consider when selecting mixing blades are the specifications and features, types, applications, and materials that will be used. The outside diameter, bore size and number of mixing blades are also important considerations. Mixing blades are removable for ease of cleaning and may be switched out for a different style when possible. Mixing blades and therefore industrial mixers are widely used across many industries including the cosmetic, pharmaceutical, chemical, agricultural, pulp and paper, automotive, water treatment, adhesive and sealant industries. Within the category of mixing blades, there are many kinds and varieties that are used for specific purposes. The blades on blenders are very similar if not identical to those on mixers; certain blenders have sharper blades that move at faster speeds in order to mix while cutting the particles into smaller sizes. Some may have teeth while others may be smooth. Mixing Blades – Reynolds Industries, Inc.
Other mixing blades are ribbon-style but remain stationary, as used in static or inline mixers. The product flows around the blades and effectively mixes itself. Ribbon blenders have flat narrow blades that rotate along a center shaft. There are two sets of ribbons that rotate the opposite of the other. When materials are fed into the tank from either end, the ribbon blades mix them with each other and, by the time the product is dispensed from the center port, the two materials are thoroughly blended. 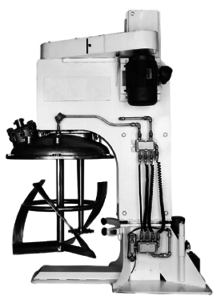 Paddle mixers have the same configuration as ribbon blenders but with paddle-shaped blades protruding from the axis instead of shearing ribbons. High shear mixers rely on mixing blades in order to reach homogenization and emulsification at fast mixing times. Because the tip of the blade travels at a faster rate than the center of the rotor, the material at the outer diameter also has a higher velocity which helps the particles mix and gain a uniform size and shape. The mixing blades of an agitator move at slower speeds and are specialized for substances with low viscosities. Mixing Blades Mixing blades push solids, gases, liquids, and vapors in a specific direction via the motion of rotating blades. This umbrella term is applied to the general part of the agitator that imparts force to the material being mixed. With the exception of drum mixers, which use the rotating action of the gallon drum to mix the contents, mixers and blenders require blades to accomplish their task.